Flowers began to appear on earth during the Jurassic period of the Mesozoic era. But they evolved further and flourished in the subsequent Cretaceous period. Flowering plants, also known as angiosperms, contain an ovule. Ovule refers to the female reproductive parts of a plant that are covered by special layers of tissue. These layers protect plant from drying out, being eaten, or developing a fungal infection. When dinosaurs roamed the earth during the end of the Triassic period, their habitat consisted of brown and green landscapes. At the time, there were no flowers or even grass. 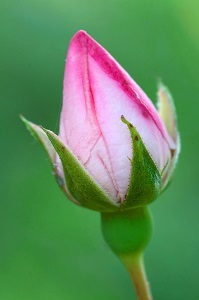 When flowers first began to develop, they were very small and most likely had no scent or color. In the Jurassic period, angiosperms grew faster in areas where no other plants were growing. Also during this time, groups of dinosaurs turned up the ground with their feet and destroyed vegetation, in a process called dinoturbation. On this land with few other plants, flowers began to grow. With the beginning of the Cretaceous period and the increase in moisture in the environment, flowers developed color and scent that attracted bees. Bees came to specialize in feeding on nectar in a process called co-evolution, which benefited both flowers and insects. Flowers reproduce using pollen. Pollen can only fertilize a plant by landing on a specific spot. Once the sperm in the pollen passes into the ovule of the plant, a seed forms. When dropped, the seed can germinate to create a new plant. Overall, each period in the Mesozoic era affected how flowers developed. The first flowers had no scent or color; now, however, there are thousands of species of beautiful and fragrant flowers.